Usually when physicists perform quantum entanglement between particles—whether it be qubits, atoms, photons, electrons, etc.—the particles are distinguishable in some way. Only recently have physicists demonstrated the feasibility of generating entanglement between particles that are completely identical. Interestingly, this entanglement exists just because of the indistinguishability of the particles, without any interaction between them. Now in a new paper, physicists have gone a step further, showing that the entanglement between identical particles can be harnessed and potentially used for quantum applications. The physicists, Rosario Lo Franco and Giuseppe Compagno at the University of Palermo, Italy, have published a paper in which they show the usefulness of identical particle entanglement in a recent issue of Physical Review Letters. As the physicists explain, in order for two independently prepared, identical particles to be entangled, they must share a region of space in close physical proximity—more technically, the particles' wave functions must spatially overlap, at least partially. If there is no spatial overlap, then there is no entanglement. If there is partial spatial overlap, and measurements are made within the overlap region, then there is conditional entanglement with a certain probability. Only when the wave functions exhibit complete spatial overlap is there always entanglement, though the amount of entanglement depends on both the measurement and the shape of the wave functions. The main result of the new study is that the physicists developed a procedure to directly extract the entanglement that occurs when the wave functions completely overlap, and then use this entanglement as a resource for various applications. 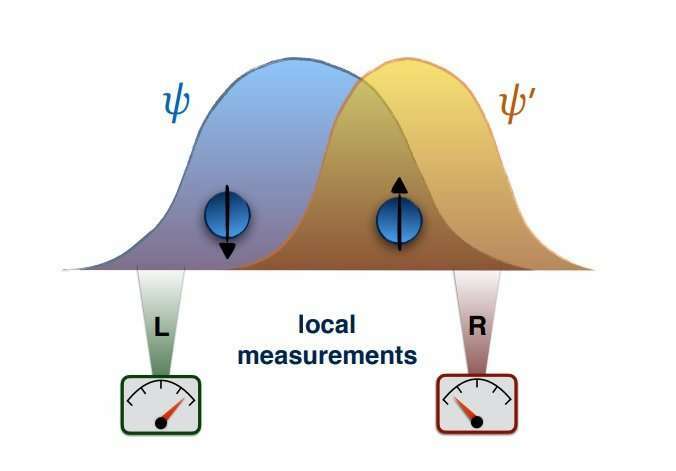 To do this, they extended the concept of LOCC (local operations and classical communication), which is typically used to quantify the entanglement between distinguishable particles, to indistinguishable ones. This required defining spatial LOCC, or sLOCC, operations, which makes it possible to quantify the exploitable entanglement contained in a state of independently prepared identical particles and use it—for example, for a teleportation protocol. "Our study indicates that a basic entangling mechanism can be realized by simply bringing independent identical particles to spatially overlap and accessing the entanglement by sLOCC operations," Lo Franco told Phys.org. "This operational approach is what is desirable for experiments." The physicists expect that it should be possible to experimentally carry out the new procedure using straightforward methods. "For instance, a simple implementation may be obtained by a modified Hanbury Brown and Twiss photonic setup with orthogonal polarizers placed before detection," said Compagno. In the future, this new kind of entanglement could have applications in areas ranging from quantum networks to Bell experiments, among other uses.